Have you ever wondered why we evolved to dream? Or what your dreams mean? Or why your dreams can seem so real and meaningful when you experience them but are then mostly forgotten? Or why, when you do manage to remember a dream, it often seems so weird? This site contains the answers to these age-old mysteries as well as explaining the connection between dreaming, depression, schizophrenia and hypnosis. It also explains the overwhelming importance to evolution of the brain state known as REM (rapid eye movements). When something evolves in Nature it is usually for a good reason and dreaming is no different. 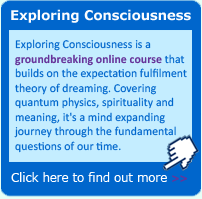 The expectation fulfilment theory of dreaming (first published in 1993 by psychologist Joe Griffin) explains how, far from being a mere by-product of 'brain down-time' as some people think, or a way of consolidating memories as others suggest, dreaming evolved to play a central role in keeping us sane. However, in some circumstances, it can, quite literally, drive us mad. 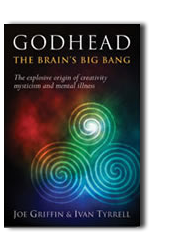 If you want clear information about the origin of creativity, what mysticism is for, or the nature and true function of consciousness, a new book, Godhead: The Brain’s Big Bang is for you. 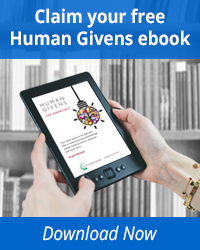 You can read its contents and introduction here.